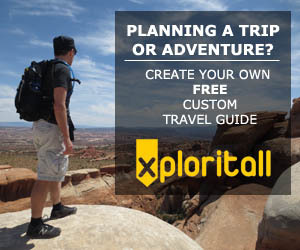 Moab, Utah is a playground for people that are outdoors-oriented. Like the mighty Colorado River, which varies in quantity and intensity while passing through town, the number of visitors to Moab also ebbs and flows throughout the year. The interests of visitors can span a wide range... from casual, sightseeing tourists to full-on extreme sports enthusiasts. The town has about 5,000 year-round residents, but it's common for the population to swell to 60,000 people during events or during the peak summer season. There is plenty to see and do in and around Moab to easily keep you busy for a week. 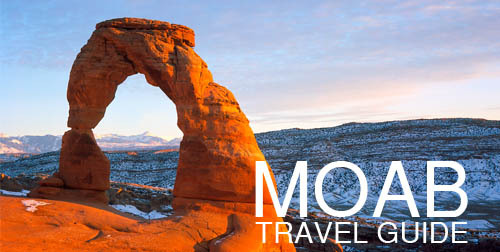 Moab is 235 miles south of Salt Lake City, 100 miles west of Grand Junction, CO, and 354 miles west of Denver, CO.
Moab has a small regional airport offering charter flights and some scheduled flights by Great Lakes Airlines. The Utah desert can get pretty hot in the summer and cold in the winter. The town sees most visitors in the summer, especially in mid-to-late May and closer to September when it is not as hot. The best time to visit really depends on your reason for going and your tolerance to the hotter or colder temperatures. Rafting is better after the snows melt in the Colorado mountains. Mountain biking is perhaps what Moab is best known for around the world. The area features countless miles of desert trails - from meandering packed sand and gravel trails for beginners to challenging slickrock trails for experts - there's something to satisfy everyone. 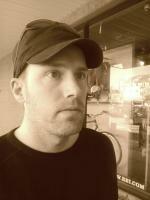 Bring your own bike or rent from one of several bike shops and outfitters in town. Prices range from $40-70 a day (cheaper for half-day or multi-day rentals). Most shops can help you get to the popular trails via a shuttle if you don't have a bike rack. The geologic formations in the area are awe inspiring. As nice as they appear in pictures, they must be seen in person. Arches National Park contains many arches, rock towers, and other unique features formed by sandstone eroded by wind and rain over the course of millions of years. Two of the most popular arches are Landscape Arch, a slender arch spanning longer than a football field, and Delicate Arch, which is positioned in a picturesque scene offering incredible vistas of the surrounding landscape. Most attractions must be accessed by hiking trails from parking areas ranging from easy to strenuous. Be sure to bring plenty of water and sunscreen. Most trailheads have vaulted toilets, but water is only available at the main visitor center and the Devil's Garden parking area. The entrance fee is $10 per car (good for 7 days). The Moab area boasts hundreds of miles of trails and old mining roads to experience on an off-road vehicle. These trails range from scenic drives passable in a 2-wheel drive vehicle, to trails requiring a 4-wheel drive vehicle and nerves of steel. Dirt bikes, Razrs, and Jeeps can be rented in town to take on the trails. Additionally, several outfitters provide guided tours. Moab Adventure Center has a very entertaining Hummer tour (2, 3, and 4 hour options available starting at $81). We did the Hummer Sunset Safari tour and highly recommend it! ATVs and OHV (Off-Highway Vehicles) can be ridden on many nearby trails, such as Hurrah Pass Trail or the Monitor and Merrimac Trail. Note that non-Utah residents bringing their own ATVs or renting an ATV in Moab may need to purchase a Non-Resident Permit ($30). The Moab Information Center on Main Street can assist with permits as well as helping you find trails to ride. Rafting is available on both the Colorado and Green Rivers in the Moab area. Several tour companies offer excursions lasting anywhere from a few hours on a leisurely float over minor ripples to epic, multi-day tours including class III-V rapids. The higher rated rapids are located after the confluence of the Colorado and Green Rivers inside Canyonlands National Park. We did an a.m. tour with Moab Adventure Center, from Hittel Bottom and Rocky Rapids on the Colorado River. The trip starts at the Adventure Center at 8:00 am and returns at 12:30 pm (we actually returned a little later due to headwinds on the river), and costs $54 per person. This trip was very mellow, more of a family-oriented trip with a few minor whitewater sections (unclassified). The guides are very friendly and knowledgeable about the geology, flora, fauna, and cultural history of the area and will point out interesting facts along the trip. The abundant rock fins and canyons in the area offer countless opportunities for Canyoneering, an activity where hikers can ascend and descend using ropes into areas not accessible by hiking alone. Outfitters in town can arrange Canyoneering & Rappelling tours. Make sure you do your homework to know what locations are off-limits. There are numerous sheer cliff faces made of Wingate Sandstone, as well as challenging towers, making the Moab area a climbing mecca. While not as popular as mountainbiking, road cycling is quickly becoming a draw in its own right. Cyclists can ride many of the canyon roads, as well as inside the two National Parks (Arches and Canyonlands). Bike admission into the parks is currently $5 for each rider. But be careful; many roads do not have dedicated bike lanes, and drivers may easily be distracted by the area sights. Though not as popular as Arches National Park, Canyonlands is the largest National Park in Utah. The Island in the Sky district is about a 45 minute drive from Moab. Canyonlands has attractions such as Mesa Arch (best at sunrise! ), Upheavel Dome, and many overlooks. The Islands district of Canyonlands offers more of a backcountry experience than Arches National Park. A permit is required for overnight trips in the backcountry. Several long trail hikes are available in the park. The Moab area is a dream location for photographers, both amateur and professional. There are limitless opportunities to photograph the rock features, landscape, and wildlife with variations in weather and sunlight. Especially popular times to take photographs are sunrise and sunset, which gives the red rock sandstone an otherworldly glow. Want to see the incredible sights from a whole new viewpoint? Hit up one of the outfitters in town offering skydiving jumps, hot air balloon flights, or flights over the canyons in a small plane or helicopter. In town there are a number of hotel and motel chains. There are also a handful of small hotels geared toward the adventure types, with names such as "Base Camp." Private rental apartments can be found as well. Note that accommodations can quickly fill up during peak vacation times, weekends, or when a special event is being held. Campsites are the most abundant lodging option. Just inside the town limits you can find commercial campsites, with services such as showers, hot tubs, wifi, and RV hookups. Tent sites run between $20-30 per night here. These can also fill up so it's best to reserve in advance. Other campsites can be found outside town in the National and State Parks. Additionally, Bureau of Land Management (BLM) campsites are available on a first-come, first-served basis.